Sentry UV Lights Keep Jersey Wahoos’ Swimmers in the Water - ChlorKing, Inc.
It’s virtually impossible to train Olympic swimmers when the local board of health shuts down your pool because of chloramine issues. And, it’s hard for swimmers to maintain their training routines when respiratory problems from chloramine issues shut them down. But chloramines haven’t been a problem for the Jersey Wahoos, Voorhees, NJ, outside Philadelphia, since 2002, when they installed ChlorKing Sentry UV systems with dual output lamp technology. Carroll, who serves Jersey Wahoos as head coach and manager, said the Sentry solution was the suggestion of Rick Marschall, who covers South Jersey for Treatment Specialties, a ChlorKing distributor serving New Jersey. “We had something that wasn’t working, and when Rick suggested the Sentry UV, we bought the SAG720A for our 160,000-gallon main pool very quickly,” Carroll said. For Jersey Wahoos, the new Sentry UV system reduced to chloramine levels to 0.1 in five days, and nobody has looked back. The 720A uses low-pressure, high-output amalgam UV technology to achieve 4-log reduction for the inactivation of cryptosporidium and other chlorine resistant bacteria found in swimming pools and spas. The system is built with 316L stainless steel and is electropolished for a highly reflective interior. The SAG 720A is designed with a patent-pending quick-disconnect sleeve assembly for removal, replacement or repair. It can be installed horizontally or vertically to fit in most existing pump rooms. The 30,000-gallon lessons pool is protected from chloramines by a ChlorKing SAG240APVC Sentry UV system. The SAG 240APVC is built with schedule 80 PVC and lined with the same 316L stainless steel for maximum reflectivity. Sentry ultraviolet light systems use dual output lamp technology to meet two needs at the same time. While UV is produced at 254nm, ozone is also produced at 185nm, adding to the sanitization of the water flowing through the chamber. This additional sanitizer helps reduce the amount of chlorine a pool or spa requires. Marschall, who has been in the pool business since 1986, when he joined a family business that’s now 54 years old, said the problem is typical for indoor pools, and he traces it back to when the owners and operators of indoor pools began to seal windows for energy efficiency. Keeping the pool operating 18 hours a day is a must for Jersey Wahoos. Lap swimmers get the day started at 4:45 every morning, and as the day moves along, there are swim-school lessons for 500 children per week and swim team sessions from 3 to 10 p.m. with swimmers as young as 5 years old in pre-competition training through competition training for a variety of age and skill levels, including adults. Eight lifeguard classes during the year certify some 200 students. Carroll is looking to start a water polo program in the near future. 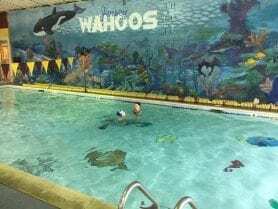 But it’s the swim teams that have kept the interest and membership high for Jersey Wahoos, which was formed by the parents of competition swimmers in 1973. Carroll has been the program’s head coach since 1987, and in that time, Olympians Sean Killion (1992 Barcelona, 400m and 1500m freestyle) and Peter Wright (1996 Atlanta, 1500m freestyle) competed and trained there. Wright took a year off from his studies at the University of Virginia to train at the pool. Today, Carroll notes, the college programs have top-flight facilities and work hard to keep their top competitors and Olympic hopefuls on campus. Still, Wahoos alumni have made it to Olympics qualifier events, and dozens are swimming in college competition. Nineteen members of the Class of 2017 have college commitments, and 14 members of the previous year’s class are swimming in college. Those results add up to a feel-good story for Jersey Wahoos swimmers and parents, but the bottom-line good feeling is that ChlorKing’s Sentry UV lights keep the pool water healthy so that swimmers never miss a stroke.